Charlotte became one of the Confederate navy's most important manufacturing centers during the Civil War. The incongruity of a landlocked city housing a navy yard is explained by its location in North Carolina, where it was relatively safe from potential Federal activity. The city was also an important rail center that facilitated movement of matériel throughout the South. In May 1862 the Confederacy established a navy yard in Charlotte to replace the one lost at Norfolk, Va. Early that year, fearing that it might be forced to abandon the facility, Confederate secretary of the navy Stephen Mallory quietly instructed the commander at Norfolk to begin planning for the relocation of machine tools and equipment that were not required for current projects. Charlotte was selected for the new site because of its rail connections with coastal cities. The government in Richmond purchased property and immediately began planning to establish a navy yard in the city. In early May the first equipment, including lathes, planers, and a small steam hammer, was moved to the new facility. The importance of the new yard can hardly be overestimated. It manufactured nearly all of the propellers, shafts, and anchors for the Confederate navy. Additionally, although power plants complete with boilers and engines were not made there, many of the parts for them were. 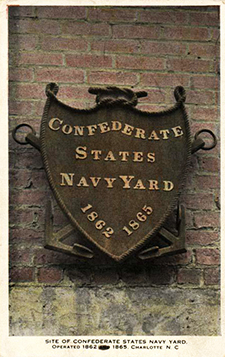 The Charlotte Navy Yard was the only Confederate facility capable of such heavy forging. It also produced ordnance for vessels, including gun carriages. In June 1863 Charlotte became responsible for casting all of the shot and shell for the vessels in Charleston and Savannah. Further, the yard was capable of forging specialized wrought-iron shot for use against Union ironclads. The Charlotte Navy Yard remained in operation until the final flight of the Confederate government in April 1865. Ralph W. Donnelly, "The Charlotte, North Carolina, Navy Yard, C.S.N.," Civil War History, vol. 5 (1959). William N. Still Jr., Confederate Shipbuilding (1987). "Confederate Navy Yard." North Carolina Highway Historical Marker Program. http://www.ncmarkers.com/Markers.aspx?ct=ddl&sp=search&k=Markers&sv=L-56 (accessed November 9, 2012). Alexander, Violet G. "The Confederate States Naval Yard at Charlotte 1862-1865." Charlotte News March 14, 1924? http://archive.org/details/confederatestate00alex (accessed November 9, 2012). Alexander, Violet G. "The Confederate States Naval Yard at Charlotte 1862-1865." Southern Historical Papers 40. September 1915. Richmond, Va.: Wm Ellis Jones' Sons, Inc. 1915. http://archive.org/stream/papershis38soutuoft#page/182/mode/2up (accessed November 9, 2012). Donnelly, Ralph W. "The Charlotte, North Carolina, Navy Yard, C.S.N." Civil War History 5. No. 1. March 1959. "Postcard, H.19XX.319.26." 1900-1910. North Carolina Museum of History. Is there a list of those that worked at this Naval Yard, supposedly my great grandfather worked there, but found no prove. Do you know what the flag of the 26th NC co. F "The Hibriten Guards" formed in Caldwell Co. This is an excellent question! But I'm afraid there is no one single answer. 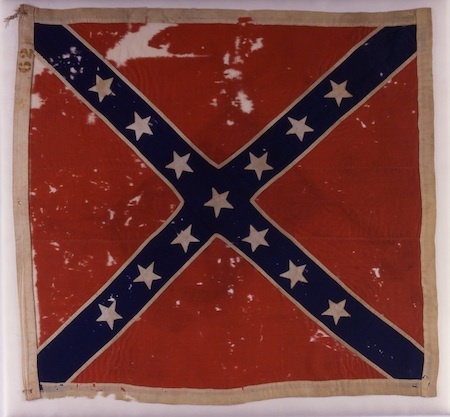 The North Carolina Museum of History collections include a flag used by the 26th Regiment. According to the item description, the flag was a replacement for the flag captured at the Battle of Gettysburg. Here is a link to the flag in the museum's collection: Link. The flag lost at Gettysburg is part of the permanent collection of the Museum of the Confederacy in Richmond. The flag is currently on loan to the NC Museum of History and shown in the public exhibits. Here is an image of the battle flag: http://www.wlu.edu/Images/Flags/WD62.jpg. In her two volume work Blood and War at My Doorstep (XLibris, 2011), Brenda McKean includes a paragraph specifically mentioning the Hibriten Guards and an associated flag, described as: "blue with the North Carolina coat of arms painted by Annie's sister" (Volume 1, p. 53). McKean also mentions an additional flag made for the 26th. The "Annie" of the first reference was Ms. Annie Rankin, and apparently the flag may have been made from a dress belonging to her. The description of this flag, with the coat of arms, is quite different from the images of the two flags I included links for. I can find no additional references to what happened to the Annie Ranking flag. Which of course doesn't mean they don't exist! In addition to McKean's book, you may be interested in Rod Gragg's Covered with Glory: the 26th North Carolina Infantry at the Battle of Gettysburg (HarperCollins, 2000). The book has numerous references to the battle history of the 26th's flags (you can also find them on Google Books). I hope this helps! If you locate additional information, please share it with us!